Need a packed approach to monitoring tooling wear? The combination of a signatureACE® and the Signature Technologies BL Series Ball-lock Load Cells or CSL Series Standard Load Cells provides a winning combination that provides of-the-shelf serviceability. 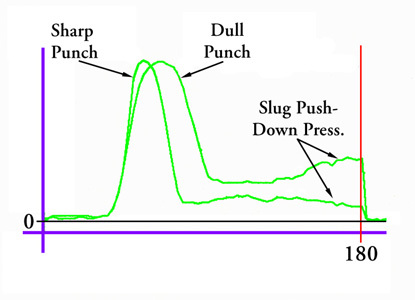 With Signature Technologies SamView™ software package can be used to monitor the force profiles of punches and forming tools. The system works by placing a load cell behind the punch, and converting the punch force to an electrical signal that the SAM™ module uses to display the force profile of the tool. 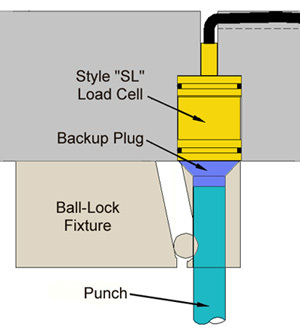 The Load cell no way alters the easy replacement feature of the Ball-Lock fixture, and requires only a counter-bored recess under the punch holder for the load cell to install in, AND a hole for the load cell cable to exit through. The Load cell is sized to match all the common sized fixtures, and calibrated to withstand the loading of the full range of punches normally used with them. NO LIMITED 150% overload limit customary with most conventional load cells...The ST load cells are capable of withstanding significant overloads as would be expected in stamping "mishaps". The measurement can either be calibrated, or comparative depending on the application. Calibrated measurements will give the Tool Force in the user’s selection of units, and with the use of the Signature Technologies FeatureView™ software the user can generate a calibrated “Work” measurement that is sensitive to tool wear in many cases. Multiple sensors can be used if multiple assembly operations are performed simultaneously. The SAM™ module can handle inputs in groups of 8 up to 56 total points.